Prince Liam (William Moseley) and Prince Robert (Max Brown) stepped into the boxing ring to do battle at the People's Gala in tonight's episode of The Royals. Well, at least that was the official version of the story. Unofficially, Liam definitely had something to prove after his older brother had returned to steal his charity, his crown and his girl. "I won't play your fool," he told Robert before the match. "You give them a good show, and I'll give them a good fight." Keep reading to find out what happened! First, Queen Helena (Elizabeth Hurley) wanted Robert to focus on selecting his future queen, so she instructed Willow (Genevieve Gaunt) to put together a list of appropriate candidates. However, Robert only had eyes for Kathryn (Christina Wolfe). He arranged the royal auction so she would win the wine tour with him and also made a grand gesture by asking the press to take their first photo together. He later surprised her with a private dinner and promised their relationship no longer needed to be a secret. "This is a way of introducing you to the public without the press clamoring for a story," he said, adding, "I just want to be with you here like this." Meanwhile, King Cyrus (Jake Maskall) had cooked up another devious scheme to win the upper hand in the upcoming vote for the throne. He hired Dame Cinnamon to seduce Charles Wescott, the lead parliament member who would be selecting the privy council committee. Turns out, Charles had very particular tastes in the bedroom, so Cyrus had more than enough ammunition for blackmail after he caught him crawling around in a diaper with a pacifier in his mouth. "I'd advise you then to lean toward members of parliament who appreciate a king who places less value on the book and more value on discretion," Cyrus cautioned. "So, nobody has to find out what a naughty baby you've been." 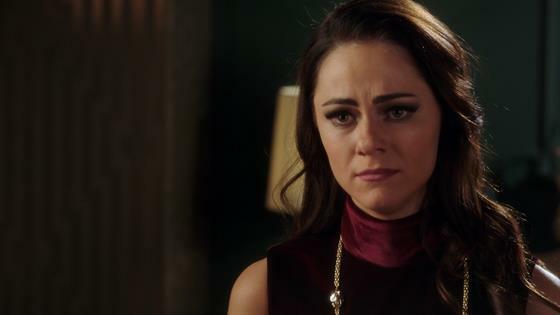 Meanwhile, Princess Eleanor (Alexandra Park) was still struggling since her split with Jasper (Tom Austen). But luckily, she met the handsome Prince Sebastian Idrisi, who offered her some comfort during a game of croquet at the gala. "The sun still rises, and the world doesn't end," he told her. "And, one day it gets better. Eventually, you even smile!" Helena also made a connection with entrepreneur Jack Parker, who had won an afternoon tea with her at the auction. But her new suitor stirred up trouble with her current friend with benefits Spencer Hoenigsberg (Jules Knight), who was clearly jealous to see her with another man. Liam didn't hold back when it was finally time to fight and took all of his pent up frustrations out on Robert in the ring. In the end, the younger prince came out victorious after he knocked his brother out. But afterward, Liam got angry when Robert implied that he let him win just for the show. "Did you think you actually beat me little brother?" he asked amused. Liam then challenged him to a rematch. However, Robert still had the advantage. "Liam, stop," he said after punching him in the face. "I know you're going to keep getting back up because that's what you do, but I will keep putting you back down, and I don't want to do that. I love you, brother." Robert then left Liam bloodied and bruised before walking out of the palace with his arm around Kathryn.